Too much gas in your little bundle of joy? Praying for that colic to subside?? Well, we believe in GripeWater! 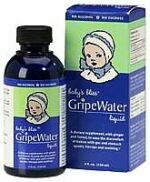 It's a liquid that has evolved over time in response to babies and children suffering from minor stomach discomfort. Handed down from generation to generation, it has been in use for over a hundred years and widely used in Europe and many other countries. Try it today... it's of alcohol and sugar and contains no fillers, artificial colors or flavors, yeast, wheat, gluten, soy, dairy or starch. It contains sodium bicarbonate. There's a dropper with the bottle but you can also add it to your baby's bottle.